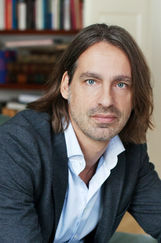 Richard David Precht, born in 1964, is a philosopher, journalist, and author, and one of the most distinctive intellectuals in German-speaking countries. He is an honorary professor of philosophy at the Leuphana University in Lüneburg and at the Hanns Eisler Academy of Music in Berlin. His books Who Am I and If So How Many?, Love: A Disorderly Emotion and The Art of Not Being an Egoist are international bestsellers and have been translated into 40 languages. Since 2012 he has been the moderator of the philosophy program Precht on the ZDF television network.